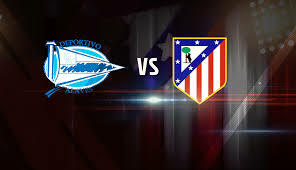 Deportivo Alaves hosts Atletico Madrid in a match from the 29th round of the Spanish La Liga. Here are our thoughts about this clash, which is going to be played on Saturday evening. Deportivo Alaves are having a terrific season so far. They are 5th in the league standings with 44 points, being just 2 points behind the 4th Getafe. It’s absolutely amazing that they could qualify for the Champions League, if they have enough luck and consistency to do it. Right now Alaves’ record in the league looks like this: 12 wins, 8 draws and 8 defeats. In their last five matches Abelardo’s boys are unbeaten – two wins and three draws. This explains why Alaves are doing so well in the league so far – they are very solid this season. In their last game Deportivo Alaves achieved a 3-1 win during the visit to Huesca. John Guidetti scored a brace for the visitors, while Jonathan Calleri also scored from a penalty kick. Meanwhile Atletico Madrid are 2nd in La Liga with 56 points won so far. Right now Los Colchoneros are 10 points behind the leader Barcelona and just 2 points ahead of the 3rd Real Madrid. Atletico’s record since the beginning of the season goes like this: 16 wins, 8 draws and 4 losses. Atletico were enjoying a run of four consecutive wins in the league, but this run was ended with a 0-2 loss against Athletic Bilbao in the previous round. It was a bad night for Atletico at the San Mames Barria, which the Basques won with goals from Inaki Williams and Kenan Kodro. It’s curious that Atletico Madrid’s manager Diego Simeone made just one substitute in this game. That’s our thoughts about the clash between Deportivo Alaves and Atletico Madrid from the 29th round of La Liga.